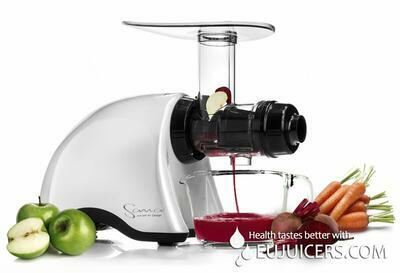 New model Sana Juicer by Omega EUJ-707 is the top between horizontal juicers. The quality motor has 70 RPM and you are able to proces all ingredients very carefully. By this way you keep vitamins, enzymes and minerals inside fresh juice. Double stage screen provide better yield and absolutely new innovation is larger feeding tube. You are able to process larger piece of fruit or vegetable and it´s very easy to clean the whole juicer Sana by Omega EUJ-707. You can use juicer for leafy greens, pineapple, red currant or celery. Except for standard fruit and vegetable you are able to use Sana Juicer like pasta maker or you could prepare nut butters or baby food, grind coffee grain or prepare icecreams and sorbets. All parts are BPA Free so you can be sure there are no unsafe materials. Juicer is very quiet and design is thought-out to the last detail. You can buy auger juicer Sana by Omega EUJ-707 for the price 409 EUR quite a lot accessories included. It´s available in red, white and chrome version.